Is the KJB “Inspired Scripture”? Was King James a Queen? Here is a comparison of the genealogy of Noah’s relatives from the Alexandrian Septuagint Vaticanus and the KJB from the Masoretic Hebrew. I’ve put the ages in numerics to make them easier to identify. The discrepancies are bolded. LXX Gen 5:25 And Mathusala lived 167 years, and begot Lamech. 26 And Mathusala lived after his begetting Lamech 802, and begot sons and daughters. 27 And all the days of Mathusala which he lived, were 969 years, and he died. 28 And Lamech lived 188 years, and begot a son. 29 And he called his name Noe … 30 And Lamech lived after his begetting Noe, 565 years, and begot sons and daughters. 31 And all the days of Lamech were 753 years, and he died. 6:1 And Noe was 500 years old, and he begot three sons, Sem, Cham, and Japheth. … Gen 7:6 And Noe was 600 years old when the flood of water was upon the earth. KJB Gen 5:25-32 And Methuselah lived 187 years, and begat Lamech: And Methuselah lived after he begat Lamech 782 years, and begat sons and daughters: And all the days of Methuselah were 969 years: and he died. And Lamech lived 182 years, and begat a son: And he called his name Noah, … And Lamech lived after he begat Noah 595 years, and begat sons and daughters: And all the days of Lamech were 777 years: and he died. And Noah was 500 years old: and Noah begat Shem, Ham, and Japheth. … Gen 7:6 And Noah was 600 years old when the flood of waters was upon the earth. The KJB has the ages work out so Methuselah dies in the exact year the flood begins. According to the LXX however, Methuselah was 167 years old at the birth of Lamech and lived for 802 years after that, for the total of 969. Lamech was 188 years old when Noah was born, making Grandpa Methuselah 355 at that time. Noah was 600 years old when the flood began. Adding that 600 to Methuselah being 355 at Noah’s birth means that Methuselah was 955 years old at the start of the deluge. METHUSELAH SURVIVED THE FLOOD by 14 years! 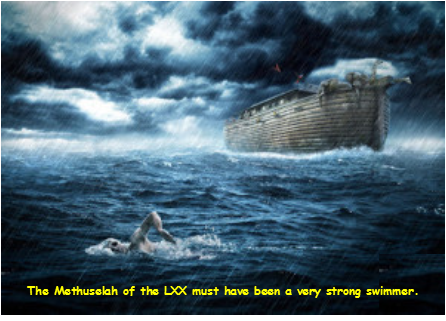 Either he was a very strong swimmer (strong enough to thwart God’s flood to destroy all flesh), or the Alexandrian texts are so ridiculous you shouldn’t use them to line your bird cage lest your parrot repeat any of that profane perversion unwittingly. And now we understand why the modern versions fail to accurately translate their own underlying text here. It would expose how absurd they are. For more examples, see Asinine Alexandrian Errors. A leading Darwinist advocates breeding "humanzees" to prove evolution. It was tried before to science's disgrace. For Easter, Illustra Media has produced a short film that dazzles the eyes with nature's beauty as a metaphor for resurrection. La Mirada films reinforces the victory of Christ over death in a series of educational, inspiring films. At the John 10:10 website, La Mirada offers s spectacular selection of great faith-building and apologetics films.